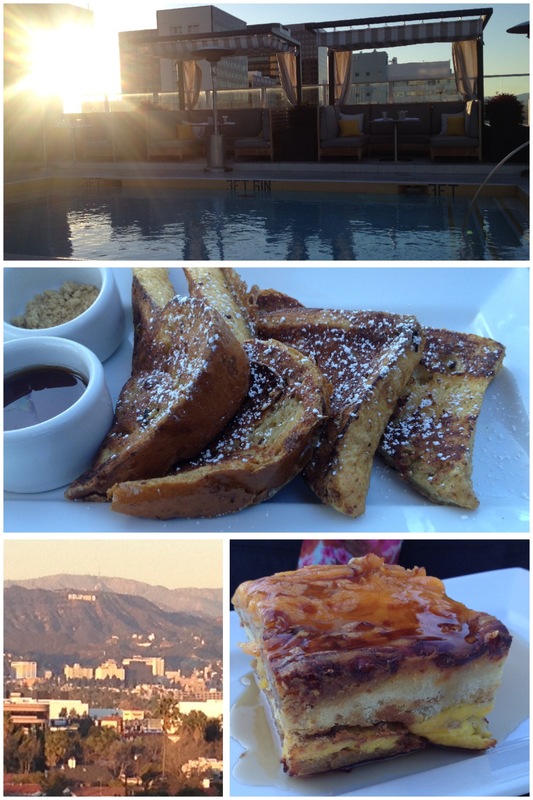 Today I had a brunch at The Roof on Wilshire. It’s located on top of the Hotel Wilshire, A Kimpton Hotel near the corner of Wilshire and Crescent Heights. I actually didn’t know that this place existed at all until yesterday. They have bottomless mimosas on weekends from 10-3 for $22. The views are breathtaking and unique- I don’t think there are many places nearby that have rooftop restaurants so it’s a different (but equally gorgeous) view than looking out from Runyon, Hollywood or Downtown. Eric Greenspan (The Foundry) opened the restaurant and the food was not surprisingly delicious. My cousin ordered the pancake lasagna – yes – pancakes, sausage, eggs, cheese, bacon, and maple cream. There is no way this is remotely healthy but it is incredible! It sounds weird/gross at first but it’s a must-try for anyone who goes here. I just had a few bites but was blown away! I ordered the Cinnamon French Toast and it was perfect. It wasn’t too heavy or too sweet. Perfectly battered and came with a side of brown sugar topping. LA is reaching arctic temperatures right now (hello 40 degrees and sunny? ), so once it warms back up I am definitely going back. Next Next post: The bazaar by Jose Andres Part tres.